This step involves systematic and rhythmic leaps to the sides, front and back. Lets watch the animation that demonstrates the adavu to the right side. Start Position: Araimandi with katakamukhams at chest level. The right hand opens out in alapadmam, tracing an arc it is stretched out at the shoulder level. Bend towards the outstretched hand. o The left leg is now landed on its toes to form a swastikam(crossed) behind the flat right feet. Stage 2: Repeat as in stage one to the left. The left hand is now stretched in alapadmam and the right hand is brought back into a katakamukham in front of the chest. Leap and land diagonally to the front on the right side and land with right feet . Fold your left leg at the knees and keep it raised behind the right leg. The right hand opens out in alapadmam, it is stretched out at the shoulder level. The left hand is stretched above the head in an upturned katakamukham. Leap back to the start position with the left feet . Fold your right leg at the knees and keep it raised beside the left leg. The right hand in alapadmam, and the left hand stretched up in katakamukham are brought back and placed in katakamukhams in front of the chest. The torso is now straightened. 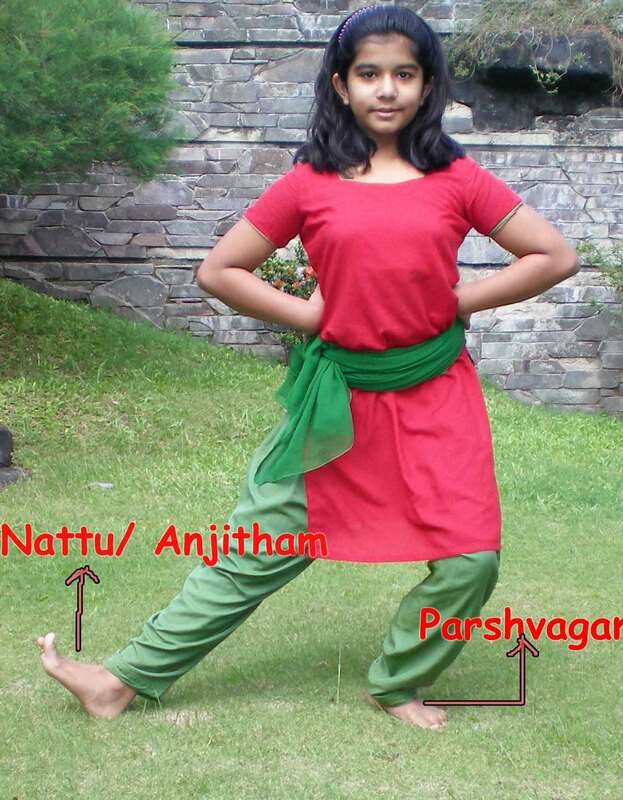 o The right leg is now placed beside the left feet in parshvagam. o Hands as above . All the four stages are then repeated to the left. Try this with this audio link .